Dorial Green-Beckham (left) and James Franklin provided many reasons for Mizzou fans to smile in 2013. 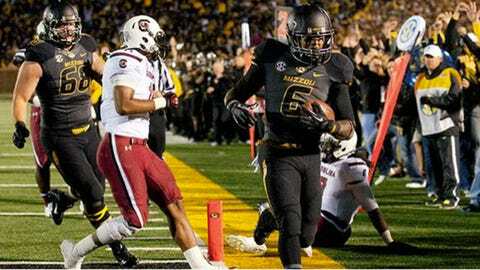 More than just a feel-good story, Henry Josey was the key cog in Mizzou’s running game. 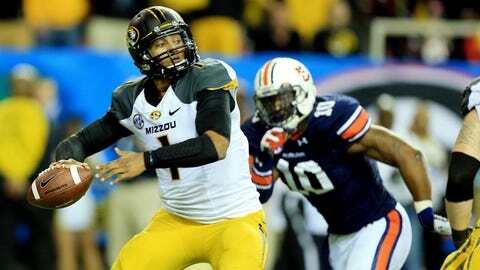 It wasn’t just that Josey returned from the devastating knee injury he suffered late in the 2011 season –after he had rushed for 1,168 yards and nine touchdowns –and caused him to miss all of the 2012 campaign. It was that he returned to the field and didn’t miss a beat. Justin Britt (68) anchored the offensive line and earned AP first-team All-SEC honors. L’Damian Washington leads the Tigers with 853 receiving yards. Washington came to Columbia with little fanfare –he was rated by Rivals.com as the 51st-best prospect in Louisiana as a high school senior –but became a solid contributor as a sophomore and started 12 games as a junior. 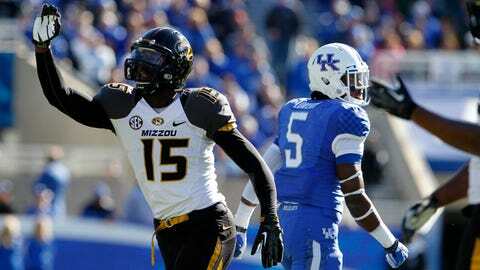 Dorial Green-Beckham set a school record with four touchdown catches against Kentucky. James Franklin regained his sophomore form and won eight of his nine starts.